This was my first introduction into “building.” I use the word “building” very loosely because there was actually very little “building” involved in this process…hence the reason why I keep putting “building” in quotation marks. Now, as Bethany predicted would happen when she saw the pile of things I hauled into our house, many of my new “treasures” sat in our attic until I took them to the thrift store when we moved. However, out of the four or five items that we kept from my pillaging adventure in my friends’ junk pile, there was a set of sturdy oak end tables. One of these end tables eventually became our kitchen island. I had been wanting an island since we moved into the house due to the limited amount of counter space in our kitchen, but Bethany was hesitant. She’s a supporter of open spaces, and she was very hesitant to spend money on an island that she might really dislike. I’d searched around for different islands during the years we’d lived in our house, but I quickly found that kitchen islands are expensive! Most stores want a couple hundred bucks for a few pieces of particle board that you have to assemble on your own. I’d seen pictures online of people repurposing dressers as kitchen islands, and I realized that dressers are big, but end tables aren’t…and I had an extra end table just sitting up in my attic. This project involved a few simple steps. I’d already done that. That’s kind of where this whole idea originated. 2. Find 4 matching legs to coordinate with the already present table legs. 3. Get some wood glue and affix the new legs to the table legs. I’m lucky that this part wasn’t too hard. The bottom of the actual table legs already had a hole in them, and the new leg extensions had screws built into them. All I did was widen the holes in the table legs to accommodate the new extensions, and I added some wood glue around the edges before attaching everything. Then I waited to let everything dry. 4. 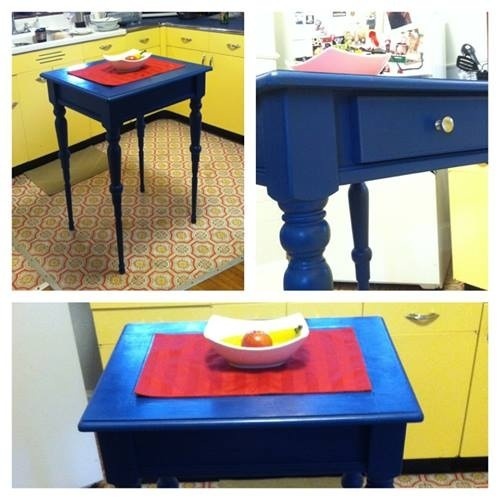 Take your wife with you to the store to pick out a paint color that you both agree on for your new kitchen island. For some couples, this would be the hardest part of the project, but thankfully, Bethany and I really like each other a lot. Choosing paint colors can be surprisingly difficult, but we managed, and it went way better than The Sweater Incident of 2012 (maybe I’ll write a blog post about that another time). I’m sorry I can’t remember the name of the color we picked. I read too many of these DIY blogs, and I think it’s a rule that you’re supposed to post the name of your paint color. I’ll just call it “Nondescript Blue” from Home Depot. 5. 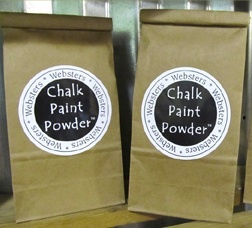 Buy some Webster’s Chalk Powder and Fiddes and Sons Wax from websterschalkpaintpowder.com. I did quite a bit of research into the best way to paint furniture pieces, and the chalk paint method has worked well for all the projects on which I’ve used it. You can read about it on the Webster’s site. 6. Mix your powder with your paint according to the directions, then paint your island. Once you’ve thrown on a couple layers of paint, finish it off with the sealing wax. Again, you can read about it all on Webster’s website. 7. Take pictures and show lots of people, especially if this is your first “building” project. Also take notice of the sweet 70’s floor and yellow cabinets in our old house. 8. Start to plan and scheme how to get real tools, so your next “building” project actually involves real “building”. This step is essential for not only building projects but also for building one’s self esteem. After reading enough blog posts about upcycling and repainting old furniture, one realizes that most of these projects are being done by stay-at-home moms who craft in between soccer games and nap times. A project with power tools involved is a real boost to one’s sense of masculinity. I don’t think I would call Bethany and I extremely creative people. We both have science based jobs, so often the right sides of our brains get a little bit neglected sometimes. I think it was out of these fits of loneliness that Bethany started sewing and I started building. Somewhere over the past few years, we’ve found a creative groove that works for us. With the help of our friends who are actually creative (we have a lot of them) and pinterest inspiration (yes, I’ll admit that I browse around on pinterest), we slowly started to let the neglected neurons on the right get a chance to work a little bit. I call this group of posts DIT (do it together) rather than DIY because we are both somehow involved in each of our little projects. I’ve helped Bethany cut fabric and tie knots when she’s sewing (it’s amazing how the ability to sew up a skin tear can correspond to sewing curtains), and she’s helped me measure boards and hold screws when I’m building things; however, even though it sounds a little bit corny, we help each other the most by providing a lot of moral support. After spending an entire day of planning and scheming, you really need someone to tell you the 4 boards you’ve cut and screwed together look good. Hopefully these posts will help you see that you don’t have to be a professional wood carver or a Mennonite to build and sew. You just need a source of inspiration. Maybe you can find that here.